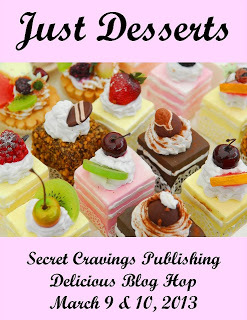 Good Morning and welcome to the Secret Cravings Publishing "Just Desserts Blog Hop". What goes better with romance than something sweet and decadent. On this hop, not only can you win wonderful prizes, great books, read about new authors, but you can get some really wonderful recipes! My recipe is always a hit whenever I make it! It is rich and decadent, just how I think true love should be. One taste and you just about swoon like the first taste of a lover's kiss. 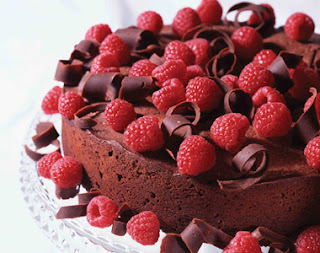 My recipe today is Chocolate Raspberry Kahlua Cheesecake. Enjoy! Comment about why good dessert is like love to win a $10 GC to Amazon and a copy of my new novel Bound in Evil! Chocolate crust preparations: Mix crumbled chocolate graham crackers, melted butter and sugar. Press onto bottom and part way up sides of springform pan. Freeze for 5 minutes. Bake at 350 degrees for 10 minutes. Cheesecake preparations: In microwave-safe bowl, place 3/4 cup chocolate chunks. Microwave on high for 1 minute or until chunks are melted; stir. Add 1/4 cup whipping cream and 1/4 cup Kahlua; stir until blended. In mixer bowl, beat cream cheese and sugar until fluffy. Add cocoa; beat until blended. Add eggs, 1 at a time, mixing well after each. Stir in vanilla and reserved chocolate mixture. Pour over prepared chocolate crust. Bake 10 minutes at 400 degrees, then decrease to 275 degrees and bake for 50 minutes. Remove from oven to cool. In microwave-safe bowl, place remaining chocolate chunks. Microwave on high for 1 minute or until chunks are melted; stir. Stir in 1/4 cup whipping cream and 2 tablespoons Kahlua; blend well. Spread on top of cake. Refrigerate for 6 hours. At serving time, beat remaining whipping cream and powdered sugar until stiff; garnish cake with small rosettes of whipped cream. You can also decorate with chocolate curls or chocolate espresso beans, or raspberries like I do, if desired. Refrigerate leftover cake. Remember after commenting to win my prizes, click the link at the top of the page to go back to SCP blog hop main page, so you can continue winning and "eating" your way through the hop this weekend. I will announce the winner on Monday!! The recipe sounds amazing. Decadent desserts are sensual almost sexual. Great to share one with your lover in the bedroom. Without spilling it on the sheets! LOL! sunnydaysbook@gmail.com. Great excerpt, too. The sounds smokin' hot! A great dessert gives you a sense of comfort and enjoyment and a sense of loss when it's gone. Hmmm....chocolate cheesecake. All these cheesecake recipes are making me salivate!!! That looks sooo goood. The dessert and the excerpt! I love raspberries! :) Yummy! Yum! Chocolate and strawberries go together nicely. How is a good dessert like love? The sweetness stays in your memory forever. Dessert is like love because if it's sweet enough, it can knock you out. Just reading the recipe I put on 3 pounds. Love it. OMG! I love chocolate and strawberries. I am definitely definitely in heaven. I once saw a desk sign that read, "I wish I could find a man who can do to my body what chocolate does to my mind." Add my favorite berry and...mmmmmmmm...I just melted. I love anything chocolate, plus Kahlua (you're not going to believe this but I'm drinking Kahlua flavored coffee right now!). The cheesecake and Bound in Evil both look so good. I think cooking is like love because you get out what you put in: time, attention to detail, quality ingredients, and they come together to create something new and unique. Loved your receipe and the excerpt. Dessert and love both bring happiness and are meant to be savored. cgibbs3471@aol.com - thanks! That is one yummy sounding dessert! You can NEVER go wrong with cheesecake. Like love, even when it's bad it's good (to know that it was bad, lol). Thanks for sharing this Marie! I lived with a chef for 3 years--whenever I had a rough day or was feeling down, he'd make the most incredible meals with the most decadent desserts for me...it was literally love on a plate! Thanks for sharing both the book and the recipe, both seem great..